Food Thought! - AP Environmental Science! 1. What does the suffix "troph" mean? The suffix "troph" mean its nourish. 2. What do you think a tropic level is? I think a tropic level is an animal pyramid level of species who its who. 3. How about food chains, food webs? Compare an contrast those terms you learned in biology. A food chains is a single path throughout the an animal chain. A food web shows the different connections between different animal groups. 4. Quickly sketch a food chain using organisms that might be found on our school grounds. a. What do you have to do to turn it into a food web? Do so. I think that they both show different connections between other organism. They all have in common of how the web works so it's start from the bottom to the top. b. How are they different from one another? They are different from one another by how the web works. So most of them are in the graph, shape and who the weak to strongest. 6. 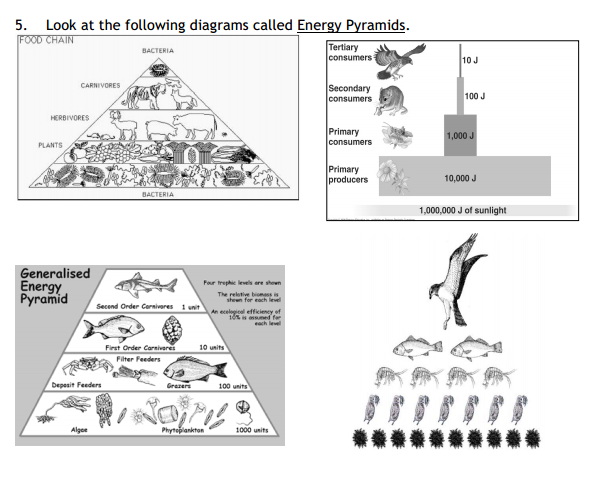 Why are there are more organisms at the base and less organisms as you travel up the pyramid? There are more organism at the base because the producers have the most energy. a. Any idea what an energy pyramid shows? An energy pyramid shows how energy is transferred as it travels through consumers. 7. Two of the pyramids have numbers. Do you see a pattern in the numbers? a. What might the numbers mean? The patters are they both decreasing by 10 percent. 1. Calculate the number of gh a hen needs to eat per year. 2. How many gh are needed for a year’s supply of hens for you, the farmer? 3. What is the total mass in kg, of the gh needed to feed all the hens for one year? 4. How many kg of soybeans are needed to feed all the gh for one year? would you have to eat per day for calories alone? 90 * 1000 = 900,000 and 900,000/600 = 1,500 people. 7. Cows produce about 19 kg protein/acre/year and soy produces 200 kg of protein/acre/year. a. Which is more efficient to eat? Why? The soy is more efficient to eat because soy produces over 10x the protein a cow does. b. Have you ever eaten a soy burger (veggie burger)? Why or why not? No, I have never eaten a soy burger. 8. In theory, the earth could support many more people if we ate at a lower trophic level. a. List 2 benefits of doing this. Less time spent on raising animals before consumption.Healthier food at lower trophic levels. b. List 2 drawbacks of eating lower on the food chain. Less of the organisms in the lower trophic levels. c. What are some benefits of being a vegetarian? Less money spent on animals, healthier. d. What are some drawbacks? Drawback is when is not having enough nutrients. level of an energy pyramid. What does this mean in terms of energy loss? It will lose 72 . 9% of the energy. mean and why should this be considered when discussing food chains and trophic levels? Bioaccumulation: The accumulation of a substance in a living organism Biomagnification. hese should be considered, because we are adding toxins in our body by the food we eat. Those toxins can also alter the food chain as it affects the health of those species that absorbed the toxins. 11. Do you think about the food you eat? Why or why not? Yes, because I need to put whats good into my body and be healthy all the time.